The big questions have a way of stopping us in our tracks sometimes. Can I actually help cure cancer? Or give the world a better understanding of something like post-traumatic stress? When faced with a problem much bigger than ourselves, it’s easy to think that one person can’t make a difference. But the generosity of Devette Russo, M11P, SK11P, and Marie Rozan, M64, J93P, A95P, proves that isn’t true. 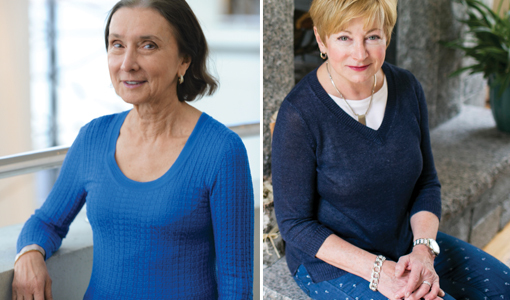 Independently, the two women support research at Tufts University School of Medicine and the Sackler School of Graduate Biomedical Sciences because they see the difference they make by helping scientists better understand, prevent and treat disease. We often associate research funding with the government, corporations and foundations. However, seed money from individuals is becoming increasingly important as the first step to gaining more support from those larger, more richly funded entities. Individual gifts such as those from Rozan and Russo enable researchers to conduct pilot research and produce competitive preliminary data that has become essential in many cases to winning more significant grants. Seed money is difficult to find, especially for younger scientists who have not yet built a professional reputation. Funding for pilot research from individuals who support not just the science, but the development of scientists as well, is essential to the future of medicine and to maintaining a robust community of expertise, whether at a medical school or within a nation. Just what kind of return on investment is possible? As one potent example, over the past 10 years, about $450,000 in Russo Collaborative Research Grant funding has translated into nearly $8 million in National Institutes of Health grants received by faculty at the Sackler School and the School of Medicine. Russo has pledged a total of $750,000, some of it to endow future grants. Even relatively small gifts to collaborative research can exert a tremendous multiplier effect. Consider one recent example of money amplified to great consequence. Tufts neuroscientists Rob Jackson and Yongjie Yang received the Russo Collaborative Research Grant in 2012. “The Russo funds were incredibly helpful in allowing us to start collecting data that strengthened our NIH grant application,” Jackson says. Ultimately, Jackson and Yang leveraged the Russo grant into nearly $3 million in NIH funding to support their research on the development of astrocyte cells, which may play a role in both Alzheimer’s and Parkinson’s diseases. The Russo and Rozan funding gives researchers the freedom to collaborate with colleagues from different areas of expertise. Receiving a grant from the Stephen and Marie Rozan Research Fund in 2013 allowed assistant professors of neuroscience Jamie Maguire, an expert on stress, and Leon Reijmers, an expert on learning and memory, to join forces. The grant brought them together to investigate how a subset of neurons in the hippocampus region of the brain may control the impact of stress for those with post-traumatic stress disorder. The pair recently submitted a proposal for NIH funding. Maguire considers interdisciplinary collaboration of this kind to be the medical school’s greatest asset. “In this economic environment, where obtaining funding is difficult, and in the Boston area, where there are numerous research institutions, these highly productive collaborative efforts are going to be what sets Tufts apart,” she says. Naomi Rosenberg, vice dean for research at the School of Medicine and dean of the Sackler School, takes the long view. She believes that individual support, now more than ever, can be game-changing in advancing medical breakthroughs and encouraging new generations of scientists. To learn how you can support collaborative and innovative research, contact Rebecca Scott, senior director of development and alumni relations at the School of Medicine, at 617.636.2777 or rebecca.scott@tufts.edu.